When it comes time for yard maintenance, we’re all in search of three key elements: productivity, efficiency, and quality. The John Deere X300 Lawn Tractor promises operator comfort, smooth mower deck engagement, tight turning radius, traction, and low fuel consumption. With the John Deere X300 you are in control; the tractor adjusts to your needs, not the other way around. Any lawn mower that requires you to use a weed whacker because it can’t maneuver around hard-to-reach spaces isn’t worth your time. The John Deere X300 lawn tractor, on the other hand, can turn on a dime and trim around the tightest corners, making it an obvious choice for tackling yard tasks. A detail-oriented tractor: The beautiful landscaping you’ve done in your yard probably looks great, unless you’re about to mow, then it looks like a big pain. Obstacles like trees, garden beds, stones, bird baths, swing sets, patios, etc. can be challenging to navigate your mower around. 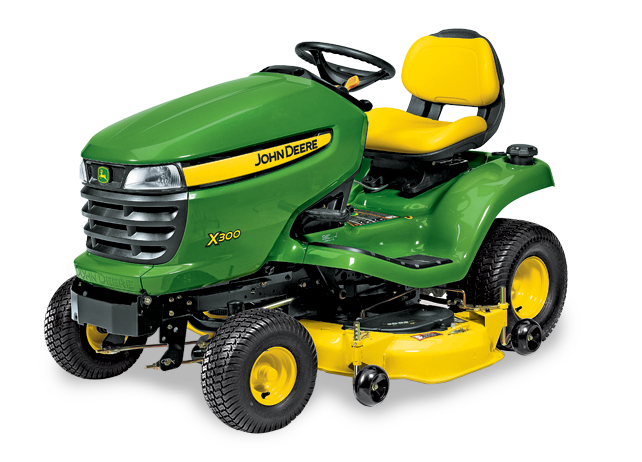 However, the John Deere X300 lawn tractor is designed with such a tight turning radius that those blades of grass that are just out of reach for most mowers won’t be left behind. An even cut: Too long? Too short? This is a timeless battle every lawn care enthusiast faces when determining the best time to mow. 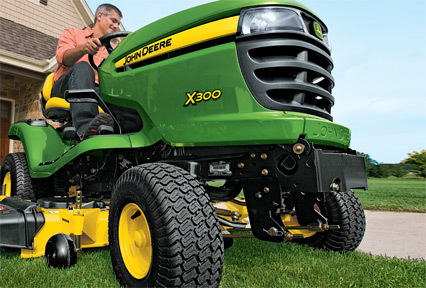 If you’ve let your grass grow longer than you normally would, the mower deck of the John Deere X300 can be adjusted to still make a perfect cut. If you’re concerned the grass may be too short to cut but it needs a trim for appearance purposes, just raise the mower deck. As we know, cutting grass too short can make it vulnerable to hot sun rays and become more prone to disease. A comfortable ride: Ergonomics is something that Deere engineers consider when designing the cab, foot pedals, monitors, and operator seat. Mowing a large lawn can take hours, even when it’s being cut by a JD lawn tractor, which can be hard on your wrists, back, and legs. The John Deere X300 features automatic transmission, TwinTouch foot pedals, PTO clutch, standard cruise control, and a supportive seat. Whether you’re confronted with a dauntingly expansive lawn or one filled with landscaping obstacles, you should feel a sense of power and control when you’re behind the wheel of the right lawn tractor. Yard work and lawn maintenance may not be the easiest job, but the John Deere X300 lawn tractor guarantees that it’s a productive, efficient, and quality one.